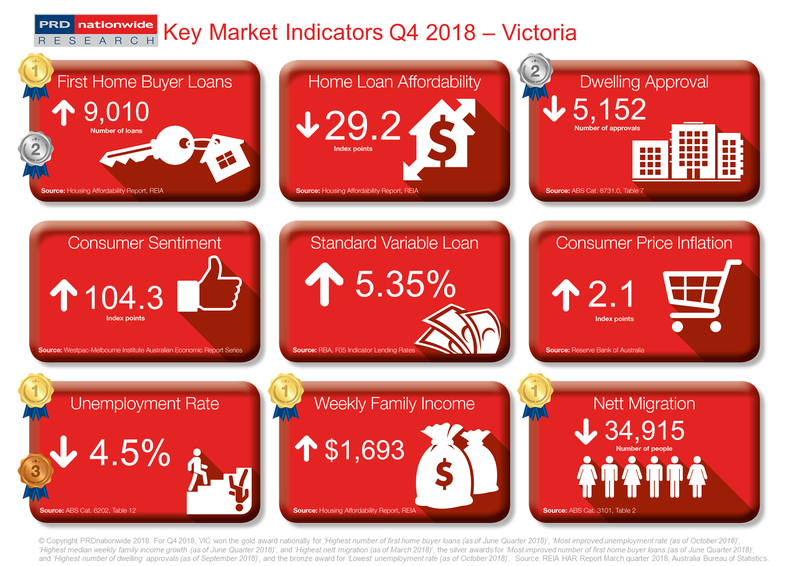 Victoria (VIC) has proven itself to be a top performer in 2018, earning the most medals in the PRDnationwide Key Market Indicators Q4 2018 Awards, and positioning itself as a market leader in many areas. It’s most notable achievement is in the first home buyer loans category, where VIC took out two medals nationally, a gold award for highest number of first home buyer loans and a silver award for the most improved number of first home buyer loans. The number of first home buyer loans grew by 35.5% over the past 12 months to the June quarter of 2018, a stable improvement compared to the 35.5% growth recorded over the past 12 months to the March quarter of 2018. This is good news for first home buyers looking to enter the market, as a stable pattern suggests that there are strong economic fundamentals (such as employment and wage growth) to counteract increasing property prices in VIC (particularly metropolitan centres). First home buyers can further draw comfort from the -22.4% decline in unemployment rate over the past 12 months to June 2018, which earned VIC a gold medal nationally in the most improved unemployment rate. This is further supported by its gold award win nationally for the highest median weekly family income growth category, recording an increase of 2.7% in median weekly family income over the past 12 months to the March quarter of 2018. More people are choosing to migrate to VIC, resulting in the state’s gold medal win nationally for the highest nett migration, at 34,915 people (as of March 2018). That said, this is a -5.7% decline over the past 12 months, which is a welcomed statistic considering the -17.5% decline in dwelling approvals over the past 12 months (to September 2018). Together, these will allow for existing stock to be absorbed by the market, which will have the potential to increase property price affordability in 2019.